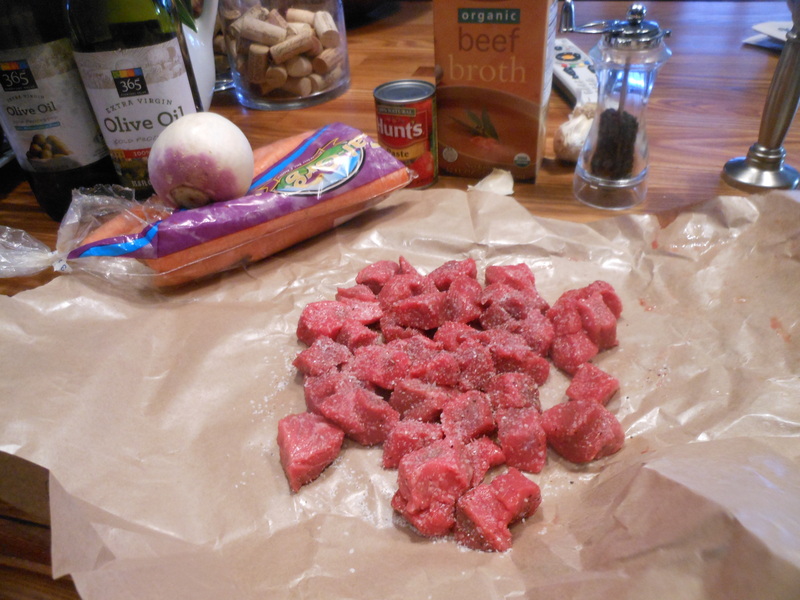 I bought some Beef Stew Meat from Whole Foods, and was trying to decide what to do with it . It was Tuesday night and freezing out here in Colorado . 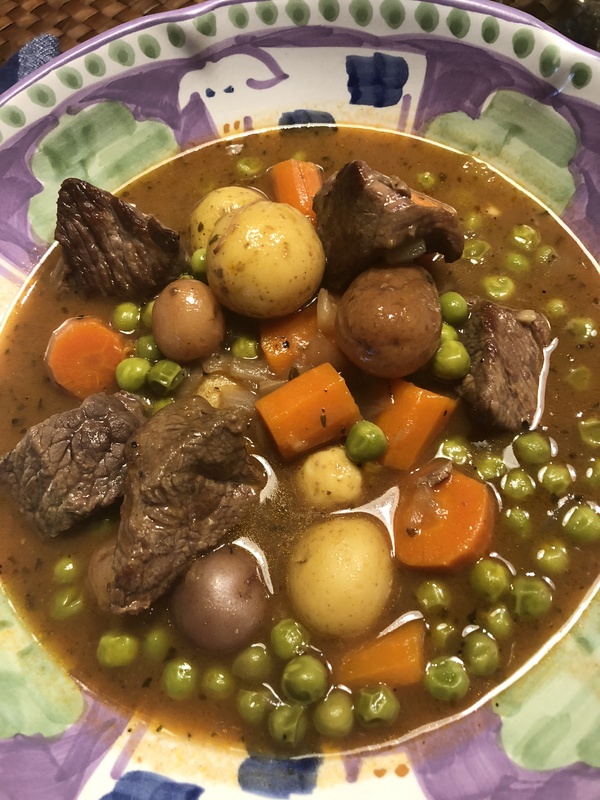 We were caught in a frozen snap of weather and there was no way I was venturing out of the house again with temperatures dropping below O. I love to make my beef stew in the slow cooker but no time for that. This does need three hours but the slow cooker needs at least 6 . If making in the slow cooker you’ll need more liquid. I will say that the key to a good stew is cooking a long time. This is super easy to make and I even got Joel to eat the turnips because he thought they were potatoes, but he knew better and asked so I had to fess up. He ate all of the carrots and all the turnips on his plate, maybe because I cut them up small? who knows. It does my heart good to see him eat a vegetable, any vegetable. I served with egg noodles, but must say mashed potatoes would be pretty awesome! * I cut this whole recipe in 1/2 for just the two of us, and it was perfect. *use whatever vegetables you’d like , it doesn’t matter, I like the turnips because they have a potato like texture and parsnips will fall apart easier. Heat olive oil in a large, heavy pot over medium high heat. Add butter, and as soon as it is melted, brown half the meat ( or as much as you can at one time without crowding) until the outside gets nice and brown and forms a nice little crust. Let it sit for a couple of minutes , then turn it as it browns. Remove the meat from the pot with a slotted spoon and put it on a plate on the side. When all of the meat is browned, just set it aside. Add the onion and garlic to the pot, stirring to coat it, and scraping up all the brown bits as you go. Cook for a few minutes till onions become transparent , add the tomato paste to the pot, and swirl around stirring it into the onions. Stirring constantly , pour in the beef stock, red wine and Worcestershire sauce. 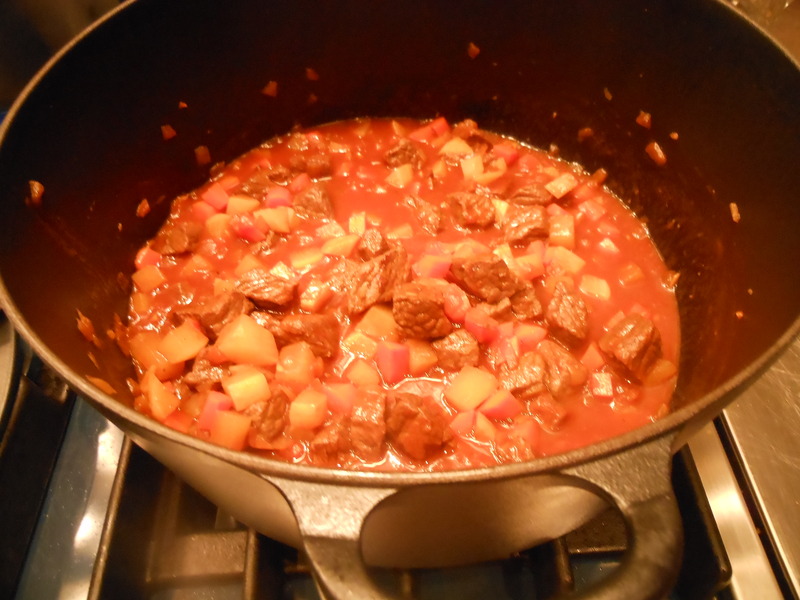 Add the beef back into pot, cover the pot, and reduce the heat to low. Simmer, covered for at least 2 hours. If liquid starts to evaporate during this period , add more stock a little at a time, or water if you have no stock. 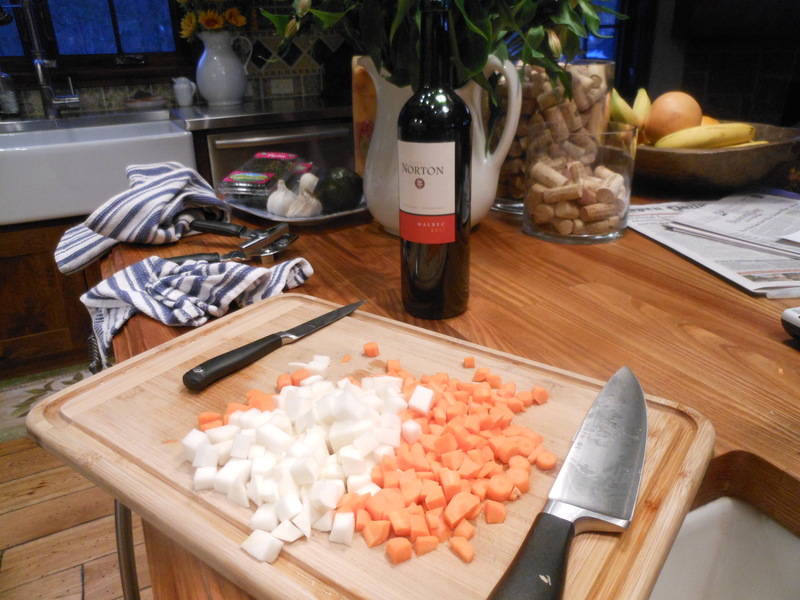 After the 2 hours of simmering, add the turnips and carrots to the pot. Stir to combine all ingredients, taste for salt and pepper, cover and simmer for at least 30 minutes I simmered for an hour. Sauce should be thick but not too thick, you can always add a little broth/liquid. 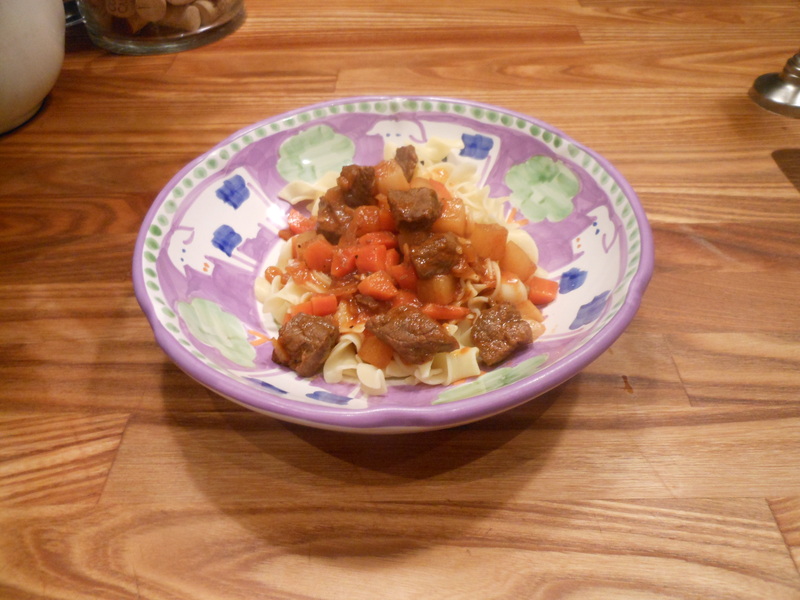 Serve hot in bowls with noodles, rice, mashed potatoes or alone. It should serve 6 nicely this way.